Kaze and The Wild Masks, from Vox Game Studio stars a bunny (and you know how much we love bunnies) who must defend Carrotland from attack by a variety of vicious yet colorful beasts in a cutesy action platformer. 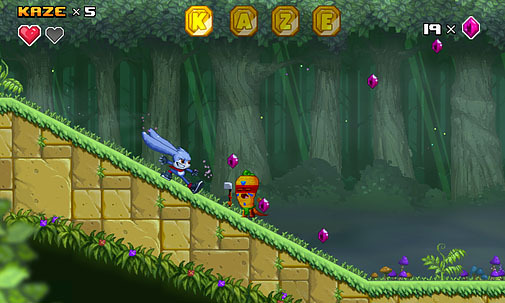 Kaze uses his big ole bunny ears to whack enemies, walk ear-over-ear along vines, toss objects and baddies, and even spin around to slow his descent. Classic platformer tropes are strongly represented, with pastoral plains, bouncy mushrooms, brightly-colored collectibles, and secret areas. Finding the game's titular masks grants him new abilities that let him run faster, swim underwater, and take to the skies. Oh, and we're not sure if this means anything, but Kaze translates to "wind" from Japanese... like Kaze no Klonoa. So there's that. The game is coming to PC via Steam in November.